Too pretty outside to work inside! I think we only got a day and a half of views like this. Maybe next September will have more. Yesterday was Breakfast Club. We had a tiny group which was great fun...just not much for show and tell. I didn't realize until today that I never got the name of the gal who made this quilt even though she sat right behind me and we talked all day...oops! Here is the strip quilt she made, Jelly Roll 1600. Last month's pattern was Jelly Jive and this was the class sample I forgot to share. October's project is geared toward Christmas and has two parts. This quilt is about 30" squared. This quick runner will also be part of the class. November's project...which I will miss...will be this quilt. Yesterday's pattern was Scrap Crazy. It entails using an acrylic ruler set from Creative Grids. I really enjoyed this project. It went so quickly. I didn't cut enough pieces to keep me busy for the entire class despite the fact that I think I spent most of my time visiting and shopping. The shop was having an incredible sale that included batiks...I enhanced my stash! I finished these 12 blocks. I used 6" strips of six fabrics. My husband is home for a little while and I am without a vehicle. (One of my son's totaled his vehicle so he is driving my car.) Why does this matter? My husband drove me to Breakfast Club. After I paid for my huge purchase of new fabric it dawned on me my husband would be witness to my big bag of fabric. Really....it is very silly of me to feel guilty about this purchase. After all...I got these fabrics for about $7.00 a yard. In Paris these fabrics would cost at least $27 a meter. But it is a habit to think I should never fully disclose how much fabric I buy. So I crammed the new fabric into my class project bag and my sewing machine tote. Did he notice how much heavier they were to load into his truck? Nope! The good news is some of my new furniture has arrived. We have a sweet little table with chairs to sit at our prow-front windows and check out the view. I had the joy (heavy sarcasm) of driving in a little ice this morning. It's supposed to be in the 40's tomorrow with lots of sunshine. Last week I painted our garage...which first required moving almost everything in it to get to the walls. (I didn't move the two airplane wheels...not many people have those in their garage!). It was an exhausting week that was not fun! I painted a semi-gloss grey color on the walls. I dooooo noooot understand why garages are always painted with a flat white paint...if it is painted at all. After moving out of our last house and seeing the horrible filth on our garage walls I was determined to get washable paint in our new garage. I wasn't consulted the day the garage was painted so of course my husband went with painter's recommendation of flat white paint. Here's the other side....much more stuff that had to be moved. Looks like an episode of, "Hoarding." We are planning to install shelving next week all along the walls and then put everything away. Then I can finish painting the ceiling. More fun! Just a little info about garages in Alaska...most of them are heated and are soooo important in our extreme climate. This is going to be a sweet man-cave when it is done. My husband wants to have the floor painted too...which in our family means another job for me. My husband is not allowed to hold a paint brush...we tried that early in our marriage. I'll put that chore on the list for next summer. Too late with snow flying to paint the floor this year. But I almost forgot about the best part of the week! I won a blog give-away! Lori from Night Owl Quilting and Dye Works sent me this gorgeous scarf she hand-dyed. It is so wonderfully soft. I never leave our Paris apartment without a scarf so this is a great gift. Thank you Lori! And I also won a copy of her latest pattern designed with her quilting partner, Kathy from Tamarack Shack, Alternate Routes. It is designed to use two fabrics but I'm pulling a third fabric in for the HSTs. This will be a project I take to work on in Paris. I do have a finish...another cross-stitch Santa. Williamsburg Santa. Adorable! Still no time for quilting! I've been helping my sons get settled into a new apartment together. My youngest son totaled his truck on Friday night. He's fine and so is the other driver but now we need to help both sons find cars for winter driving. Anchorage is not the most friendly public transportation city in the world...especially compared to Paris! And winter is coming soon to Alaska!!! I've been concentrating on house projects: varnishing window sills that weren't finished in the building process, scheduling work for my handy-man, still unpacking from last summer's move and new furniture issues. Seeing other people bring my pattern to life is so very exciting. It makes me want to post more of my quilt designs on my blog and I do have that as a goal...I'm just not sure how to make that happen living between two sewing rooms that are thousands of miles apart. When I'm in Alaska I am too busy to sew and when I'm in Paris, I have a very limited amount of quilting stuff at my disposal. I did get the binding on, "Jelly Jive," and got it washed up. It's a sweet quilt that I am thinking of taking back to Paris for snuggling on the couch. It's been a while but today I'm joining Kathy's Slow Stitching Sunday. but I still have so many to make! I like to do cross stitch on airplane trips. I pushed through my tension issues on the latest quilting project. It was so painful! But I am now ready to add the binding and that will be my handwork project for the coming week. I absolutely love putting the binding on and I almost always do the final stitching by hand. Fall has arrived in Eagle River, Alaska. The lichen is changing colors on the mountains around us and as soon as the weather cooperates I will try to capture a photo of the gorgeous colors. It prompted me to change out a quilt by my front door to one of my all-time favorites...a braided quilt, Blazing Autumn. I don't have many big walls for quilt displays so this quilt had to get folded at the top to shorten it...it works! I'm going to paint the heat register to match the wall soon...boy that bugs me in this photo! With this wall in mind I have a new quilt designed using this bear-printed batik. The colors are hard to capture in a photo but they are the colors of my slate tile floor. Of course I had to throw in a bear paw block with this design. Here's what I've got worked up on EQ. Still some tweaking to simplify the design. Working with EQ 7 means trying to figure out how to put the image in my head on a computer program. Sometimes I think just drawing it out on graphing paper like the "old days," would be so much easier but I sure do enjoy playing! I should have gotten so much done on the Labor Day weekend. After running errands all Saturday I got home and discovered my boiler was out...no hot water or heat. I didn't really need the heat but no hot water for three days was not fun. My plumber was out of town fishing in Homer. We've had non-stop rain for 40 days and 40 nights...at least it feels that way. Great quilting weather. I loaded a small quilt on my frame and got started. Half way through the top I started having trouble with loops on the back...ARGH! From my experience this is usually the result of an oddity in threading process...but after a day and a half of tinkering I can't find the culprit. Meanwhile I will rip out the offending areas and try again. All of the backing fabrics I ordered came in on Tuesday. I'm thrilled with all of them. First, a Tonga batik, Beluga Blue from Fabric.com, to go with my Blue Reveille quilt. I've visit a national quilt show. Their batik backing has a looser weave than a traditional batik. I have used their backings before and been happy with them. This is a lovely dust rose color called Hyde Park. And finally, I am trying one of the new Hoffman 1895 backings, New Grape. I got mine from one of my favorite internet shops, Batiks Plus. They always have goodies to add to my order. A free batik fat quarter, a free quilt pattern and an 18-page printed photo sample of all the 1895 Hoffman batiks. Wow! Love getting such fun surprises with my order. I just finished washing all of the backings and wanted to show the color-catchers that came out with them. I washed the purple twice...lots of bleeding! 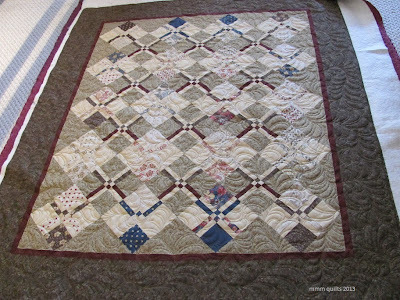 Here's the front side the quilt that started out great...hopefully I will get this threading/tension issue resolved soon. Thank goodness it is just a little throw quilt.